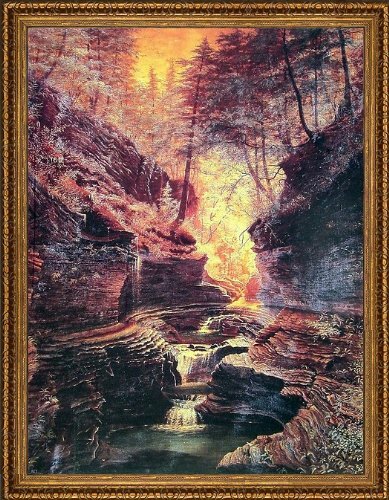 A commission to paint Watkins Glen, a stunning, glaciated gorge opened to visitors on July 4, 1863, impassioned James Hope to live his last 20 years in the idyllic setting. Scottish immigrant James Hope (November 29, 1818 - October 20, 1892) transcended life's vicissitudes by switching careers from wagon maker to artist in his twenties. • As a painter, he first specialized in portraiture. • In his thirties, he was inspired by the spectacular landscapes of Hudson River School painter Frederic Edwin Church (May 4, 1826 – April 7, 1900) to expand his artistry to include natural settings. • After serving as a Captain from May 1861 to December 1862 in the War Between the States (April 12, 1861 – May 9, 1865), also known as the American Civil War, James honored the valor which he had witnessed with compelling paintings. • Five of his most well known depict the Battle of Antietam, which stands as the bloodiest day (September 17, 1862) in U.S. military history. 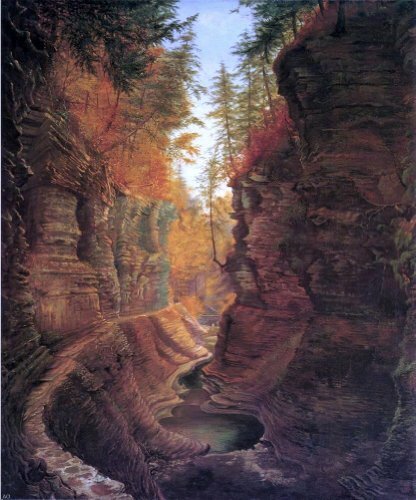 In 1870, James found sanctuary from the financially uncertain, peripatetic existence of an artist when he accepted a commission to paint Watkins Glen, a stunning, glaciated gorge opened as a private attraction on Saturday, July 4, 1863. • The glen reminded James of the rugged landscape of his childhood in the Southern Uplands of southeastern Scotland. • Closing his Fifth-Avenue studio in the art mecca of New York City, James built a studio and a home for his family and relocated permanently in 1872 to the spectacular gorge. James spent the last two decades of his life in his peaceful paradise. • He, his wife, and at least two of his adult children are buried in the village's cemetery. Watkins Glen: waterfalls ~ Glaciated landscape of Watkins Glen, opened as recreation and tourist site on July 4, 1863, enchanted and inspired artists, including Scottish immigrant James Hope. James Hope (November 29, 1818 - October 20, 1892) was born in Drygrange Lodge, in the southeastern county of Roxburgh in Scotland's Southern Uplands. Dramatic changes characterized James' early life, from childhood to teenage years. His mother passed away when he was two years old. About seven years later, nine-year-old James and his father immigrated to Canada. His father passed away during a cholera outbreak around 1831. At around the age of 15, James relocated from Canada to the town of Fair Haven, in southwestern Vermont's Rutland County, reportedly traversing the distance on foot. In Fair Haven, he apprenticed with a wagon maker for five years. Sometime afterward he enrolled at Castleton Seminary (now Castleton State College) in the adjacent town of Castleton to study art for a year. The exigencies and uncertainties of a career in art fostered a peripatetic lifestyle for the ensuing decades. Establishing himself primarily as a portraitist, James settled in West Rutland, east of Castleton. On September 20, 1841, James consolidated his ties with West Rutland by marrying homegirl Julia Marietta Smith (December 28, 1820 - September 2, 1906). After a two-year stay in Montreal to take advantage of the demand for portraitists in the Province of Canada's prosperous capital, James returned to Vermont to accept a teaching position at Castleton Seminary. The home which he built there in 1851 for his family still stands on the campus. James Hope's self-portrait reveals his gift for portraiture. By mid-century, James, falling under the spell of the soaring artistry of Hudson River School landscape painter Frederic Edwin Church (May 4, 1826 – April 7, 1900), shifted his enthusiasm and focus from portraiture to landscape painting. Jessie Hope (November 3, 1850 - January 24, 1893). The War Between the States (April 12, 1861 – May 9, 1865), also known as the American Civil War, interrupted James' halcyon routine. He served as Captain of Second Vermont Infantry's Company B from May 16, 1861 until his resignation, due to a medley of health issues, on December 20, 1862. James' regiment, Company B of 2nd Vermont Infantry, was held in reserve; James made sketches before and after the battle and also revisited the battlefield several times preparatory to painting panoramic memorials to bloodiest day in US military history. Throughout the 1860s and 1870s, James diversified his portfolio with book illustrations, landscapes, Civil War paintings, and portraits. He also participated regularly in exhibitions through the National Academy of Design, an honorary association of American artists founded in New York City in 1825. In 1870, James received a lucrative commission of $10,000.00 ($181,000.00+ in 2014) to paint Rainbow Falls in Watkins Glen, a gorge in New York near Seneca Lake's southern tip. In 1871, he was honored with election as an Associate Member of the National Academy. In 1872, impressed with the area's natural beauty, James and Julia relocated to Watkins Glen. James built a cottage and gallery-studio in the glen, siting his home and workplace on the scenic rim near the Suspension Bridge, constructed 85 feet (25.9 meters) above Glen Creek in 1873. James' second son, James, sharing his father's awe for their new hometown, captured the stunning scenery through his own favorite artistic medium of photography and sold his stereoscopic 3D prints to tourists in the Hope Souvenir Shop. James spent the last two decades of his life in the gorge, which reminded him of the landscape of his childhood in the Southern Uplands of southeastern Scotland. He was buried in the village's Glenwood Cemetery. Julia, their daughter Jessie, and their second son, James, also were laid to rest there. After James' death, his family perpetuated his memory by keeping open his gallery, which they re-established at the glen's main entrance, and by submitting his artwork to exhibitions. 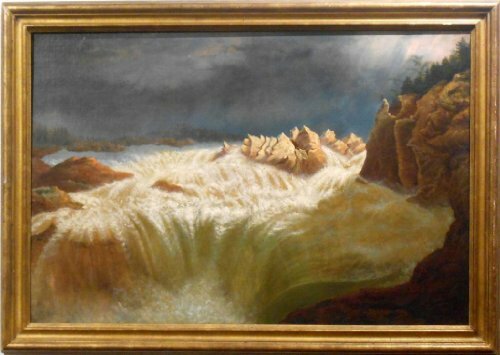 "Rainbow Falls" and eighty other paintings from the gallery were displayed at the Pan-American Exposition, the World's Fair held from May 1 to November 2, 1901, in Buffalo, in western New York. The pavilion, designed by Buffalo architect George Cary (1859 - May 5, 1945), was built of Vermont marble -- a fitting link, for the artist's admirers, to the state which welcomed him as a teenage orphan. Rainbows abound in the area of Watkins Glen known as Rainbow Falls and Triple Cascade. The abundance of falling water, in cascades, chutes, and curtains, and as sprays, provides an ideal environment, in a well-lit area of the gorge, for the creation of endless rainbows through the interplay between light and water. The landscape of Watkins Glen testifies to the distinctive glaciation which characterizes New York's Finger Lakes area. The glen's geologic profile comprises mainly limestone, sandstone, and shale. Differing in erosional speeds, these three sedimentary rocks define the glen's sculptural variations and stream gradients. Nineteen waterfalls refresh picturesque pools as Glen Creek devotes 1.5 miles (2.4 kilometers) of its total length of 17 miles (27.3 kilometers) to winding from the glen's western heights to its main entrance, which is accessed on the village's southern edge at Franklin Street (State Route 14). Elevation of 490 feet (149 meters) at the main entrance rises dramatically to 1,010 feet (307.8 meters) at the upper entrance, which looks onto open woodland. Glen Creek, the waterway which naturally carves the glen through which it flows, is a blend of tributaries, including Hamilton Creek, Hemlock Run, and Townsend Creek, which lace the Seneca Lake Valley. Flowing eastward through the village, Glen Creek extends for about a mile beyond the glen's Franklin Street entrance before emptying into the Barge Canal, which links the heart of the village with the southern tip of Seneca Lake. The spring-fed lake is the second longest of New York's Finger Lakes and is the deepest lake bordered entirely within the state. Early settlers at the southern tip of Seneca Lake referred to the nearby gorge as Big Gully and to their settlement as Salubria. On June 5, 1794, the state of New York issued a patent for 353,000 acres to Flint and Watkins, a New York City-based capital development syndicate which included among its members merchant and politician Jonathan Lawrence (October 4, 1737 – September 4, 1812), Royal R. Flint, and attorney John W. Watkins (1761 - 1847). John returned to New York City in 1808 after devoting over a decade, with the assistance of his brother Charles, to developing the economic potential of the acreage, which lay at Seneca Lake's southern tip. Wharves were installed for shipping. A mill and blacksmith shop were established in Big Gully. In 1828, their brother Samuel (1771 - May 1, 1851), a prominent New York City doctor, relocated to the area, where he was entrusted with 25,000 acres. He laid out a village, which he named Jefferson in 1842. He dotted the entrance and middle and upper reaches of the gorge with flour, plaster, and saw mills. In August 1851, Ithaca-based lawyer George G. Freer (January 29, 1809 - April 17, 1878) came to the village to defend the inheritance of Samuel's estate by his widow, Cynthia Ann Cass Watkins. After his successful defense, the native of Marbletown, in southeastern New York's Ulster County, married Samuel's widow on February 11, 1852. In April 1852, Cynthia succeeded in her efforts to rename the village from Jefferson to Watkins in honor of her first husband. securing Watkins as Schuyler's county seat in 1868. 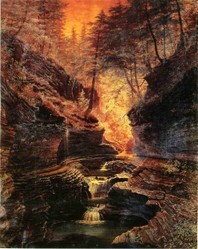 By the time of James Hope's commission in 1870 and literary giant Mark Twain's (November 30, 1835 – April 21, 1910) visit in 1871, the gorge was known as Watkins Glen, and the creek, with only a dilapidated reminder of its milling heyday, was named Glen Creek. Purchased by the state of New York in 1906 for $46,000.00 ($1,306,400.00 in 2014), the glen became the first state park in the Finger Lakes region. In 1926, the village was renamed Watkins Glen. To find the one spot on earth which conveys completely and irrevocably a sense of place is important for those who yearn to put down meaningful roots. In the last two decades of his life, Scottish-American artist James Hope found the idyllic location which provided a congruent intersection for his home and work lives. In previous decades, he had divided his time between the art mecca of New York City and his home base in Vermont. When he accepted a commission in 1870 to paint Watkins Glen, a gorge spectacularly sculpted by glaciation and erosion, James found his paradise. An artist's dream, Watkins Glen was a place where James could live, work, and die in peace. Altonen, Brian. “John W. Watkins, Esq. – Land Use and Health in Watkins Glen.” Brian Altonen MPH > History of Medicine. Brian Altonen. Blog. brianaltonenmph.com. “The Bench and Bar.” Chapter LXXVIII: 565-568. In: History of Tioga, Chemung, Tompkins and Schuyler Counties, New York. Philadelphia PA: Everts and Ensign, 1879. Crayon, Porte. "An Excursion to Watkins Glen." Harper's New Monthly Magazine, Vol. 43, No. 253 (June 1871): 37 - 49. Hope, J.D. (James Douglas). Descriptive and Illustrated Guide Book of the Famous Watkins Glen: A New York State Reservation Located at Watkins Schuyler Co., N.Y. (Head of Seneca Lake). First edition. Watkins NY: Hope Souvenir Shop, 1916. Ingraham, Tony. A Walk Through Watkins Glen: Water's Sculpture in Stone. Ithaca NY: Owl Gorge Productions, 2009. Michener, A. (Amos) J. Descriptive Guide Book of the Watkins Glen: Near Village of Watkins, Head of Seneca Lake, Schuyler County, N.Y. and its Romantic Surroundings. Sixth edition. Philadelphia PA: American Printing House, 1879. "Millions of Years in the Making: A Century of State Stewardship." New York State Preservationist, Vol. 10, No. 1 (Spring/Summer 2006): 14 - 19. Mitchell, Charles R., and Kirk R. House. Around Watkins Glen. Charleston SC, Chicago IL, Portsmouth NH, San Francisco CA: Arcadia Publishing, 2006. Morrison, Wayne E. Early History, &c. The Village of Havana, N.Y. Ovid NY: W.E. Morrison & Co., n.d.
Tompkins, Andrew, ed. "Museum Resources: Historical Photos." The Vista, Vol. 6, No. 4 (December 2013): 6 - 7. Twain, Mark. Roughing It. Hartford CT: American Publishing Company, 1872. Made in USA, at our Florida production facility, shipped gallery wrapped, with hardware, ready to hang ~ Museum quality acid-free, heavyweight archival canvas and fade-resistant, archival inks. paperfacets, Thank you for appreciating Hope's rendering of Watkins Glen. The actual gorge and the artistic interpretation are more than worth the trip. If I get a chance to visit New York I will need to see this gorge. Ferdinand Bauer: "the Leonardo of natural history illustration"
Norah's Café began serving cold and hot drinks and homemade dishes with Taubman Art Museum's opening in November 2008. The café's artistic and historical setting are glimpsed. Ferdinand Bauer created exquisitely realistic paintings and sketches of the natural world via an intricate chart of 1,000+ color references, key components of his artistry.